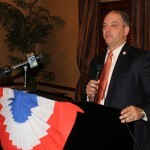 Democratic gubernatorial candidate Rep. John Bel Edwards outlined his views before the Chamber of Commerce of East Baton Rouge last week. Many members of the conservative, mostly Republican group of business owners were surprised and impressed by Edwards’ stand on the issues. He received a rousing ovation at the end of his talk. Edwards spoke of his commitment to law enforcement and told the group his grandfather, father, and now brother have all served as Sheriff of Tangipahoa Parish. When asked about rioting in Baltimore, he said he clearly comes down on the side of law enforcement. • He is an avid gun owner and has an A+ rating from the National Rifle Association. • He is pro-life and has a 100 percent pro-life rating from the Louisiana Right to Life. • He is opposed to Common Core and feels Louisiana should have its own testing standards. “Basically, I’m opposed to national testing standards. We should adopt our own standards,” he said. Edwards deviated from conservative doctrine with his stand on whether Louisiana should accept Medicaid funding from the federal government. Many conservatives say the state’s portion of the matching funds could eventually bankrupt the state. But Edwards tied his position to his earlier pro-life statements. “To me, protecting the unborn is just the beginning of being pro-life,” he said. Edwards said hard work is a large part of solving Louisiana’s problems. He said at West Point and as an Airborne Ranger for eight years, he learned to be the first one at work and the last to leave. Edwards said he favors repealing tax giveaways. He said when the economy grows, it should result in job creation but it really hasn’t. He said he wants to promote job growth that is spread around the state and not just in South Louisiana. Edwards is one of the four major candidates for governor in the Oct. 21 primary, along with three Republicans — Sen. David Vitter, Lt. Gov. Jay Dardenne, and PSC member Scott Angelle.